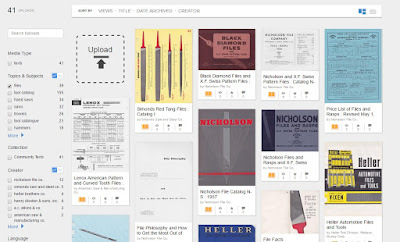 This site has free downloads of old American file manufacturer catalogs, brochures, instructions, and history, including Canada where possible. The Site Index lists small companies with the large companies that bought them. The information is being updated as needed so please check back. Click on pictures to enlarge them. 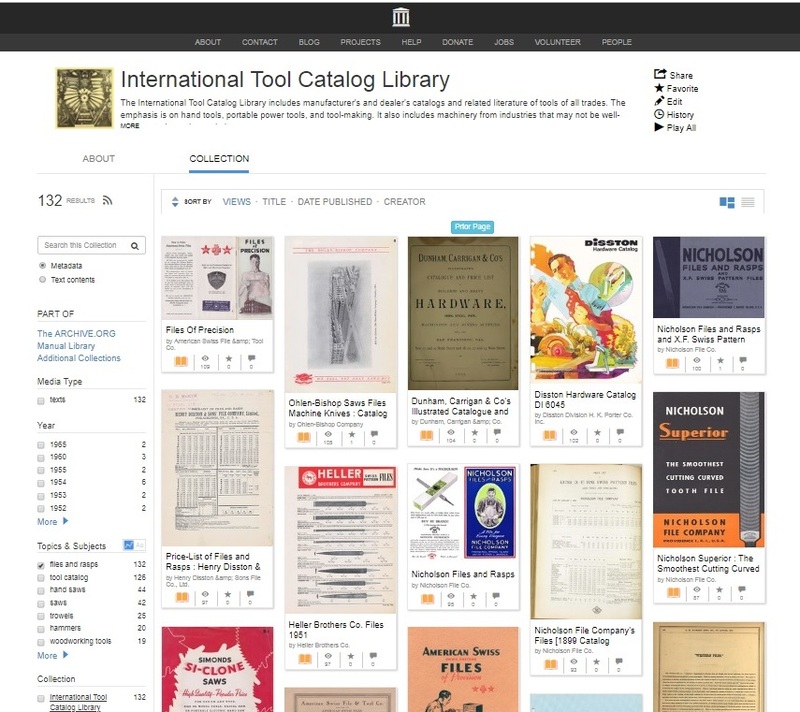 Catalogs with files and rasps from the US, Canada, and a few European countries are now in the International Tool Catalog Library on the Internet Archive. The dates are from 1823 to 1972. 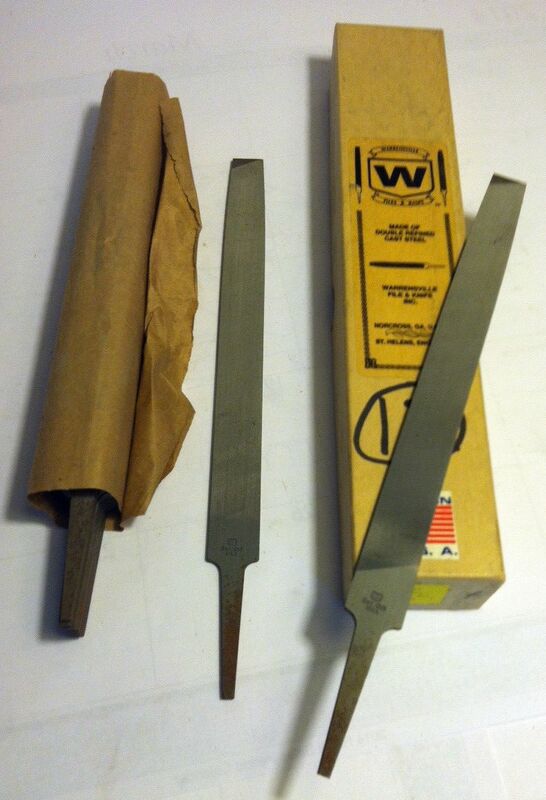 Warrensville File & Knife, Inc., is a dealer and has possibly been a manufacturer of Swiss pattern files and rasps. Warrensville began over 35 years ago in Warrensville, Ohio, a Cleveland suburb. I have scanned an older Warrensville catalog, and at that time they were located at 26309 Miles Rd., Cleveland, OH. They are now located at 5555 Oakbrook Parkway, Norcross, Georgia. Most of the catalogs I have scanned are now on Archive.org. There are 62-plus with the key words "files and rasps" and more are coming, including some rare items. 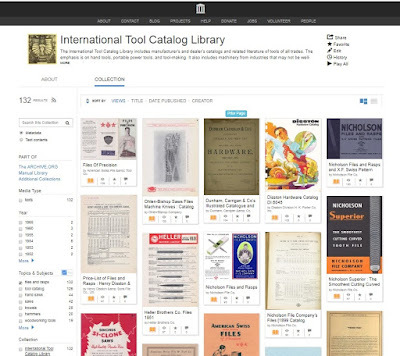 Most catalogs are American, with a few English and French tool makers also. There are 16 Nicholson File Co. catalogs, including their complete hand saw line and industrial hammers. 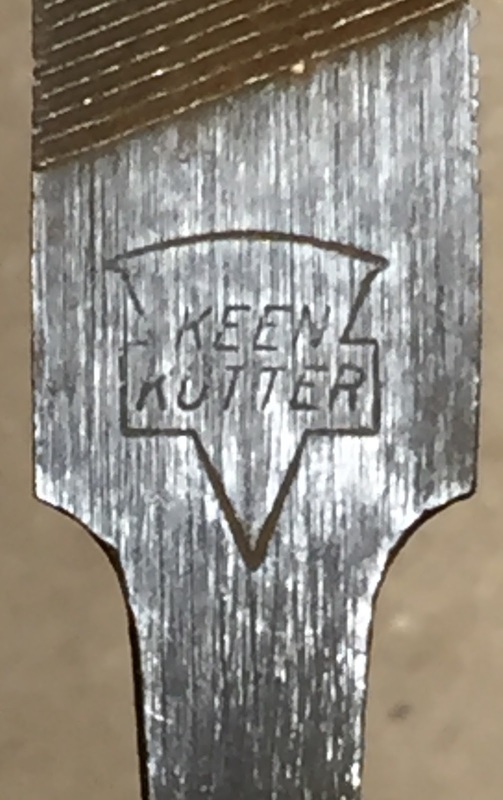 Keen Kutter was the leading brand name of E.C. Simmons Hardware of St. Louis, Missouri. In 1940 Shapleigh Hardware, also of St. Louis, took over Simmons and continued the Keen Kutter brand name. We do not know which American file maker produced Keen Kutter files, but all Keen Kutter items and their boxes are very collectible. Earlier Keen Kutter files came in wood boxes with sliding lids, and later ones in conventional cardboard boxes. 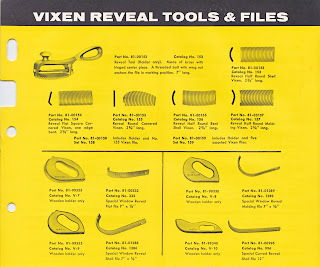 The files section from Simmons Keen Kutter Catalog No. 776 is listed in American File Manufacturer Catalogs. McClellan file, photo by Gary S.
McClellan File Co. of Saginaw, Michigan is best known as a secondary brand of Nicholson File Co., which bought McClellan in 1897-1898 during a wave of consolidation in the American file industry. Little is known so far about the history of this company before 1898. In 1883 it was operating as Michigan Saw & File Works, with William McClellan as vice president and John J. McClellan as foreman. 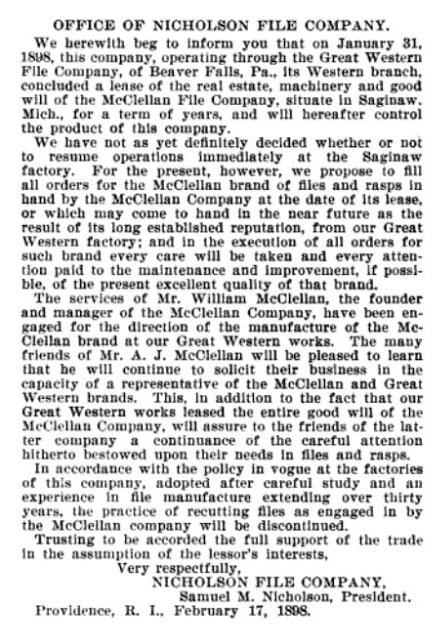 By 1889, the business was named McClellan File Co., located at 133 S. Water St., Saginaw, with principals William McClellan and Andrew Johnson. 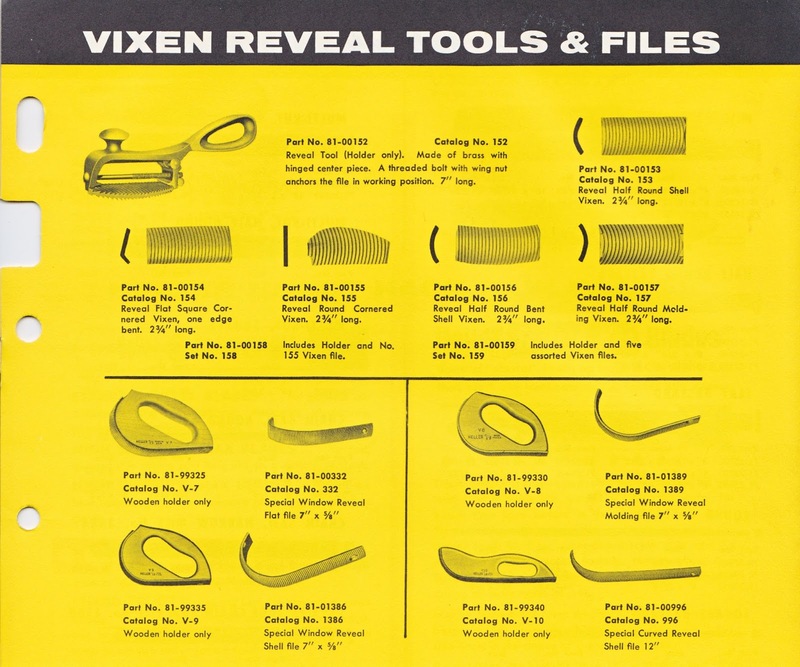 I have just posted Heller's 1965 Automotive Files and Tools, which includes the Vixen body and reveal files and 9 different file holders, along with ignition files. It also includes price lists from 1970 and 1971. Enderes Tool Co., Enderes Manufacturing Co.
Enderes Tool Company of Albert Lea, Minnesota, is best known for making chisels. In their long history, Enderes has also made files and rasps and many other forged steel tools. 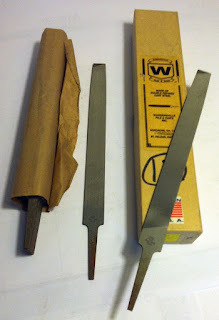 In 1921 Enderes Tool's output included automobile tools, auger bits, blacksmith and farrier's tools, bricklayer's and mason's tools, butcher tools, carpenter's tools, chisels, crow bars, files and rasps, floral tools, hammer handles, hatchets, hunting and pocket knives, mining tools, nail pullers, plasterer's tools, punches, saw blades, scissors, screwdrivers, sledge hammers, vises, wedges, and wrenches. Ernst Enderes (1861-1937), son of immigrants from Saxony, opened a blacksmith's shop in Littleport, Iowa, in 1885. In 1907 he incorporated as Enderes Manufacturing Co., and in 1910 Enderes affiliated with Albert Lea Manufacturing, 150 miles away in southeast Minnesota. In 1916, Enderes moved all operations to Albert Lea after constructing a new plant. By 1919, Enderes had 4 companies, with Enderes Manufacturing Co. and Enderes Tool Co. making tools, Harris-Enderes Co. making knives and cleavers, and Enderes, Inc., a hardware manufacturer's agency. At an unknown date, the business consolidated as simply Enderes Tool Co. Enderes Tool's current offices are at 1103 Hershey St. and its plant is at 924 E 14th St., Albert Lea. Enderes changed owners in 2012, but remains locally owned with American production. In addition to making tools with their own name, Enderes has done contract manufacturing for Sears and other brands. Here is a scan of Enderes Catalogue B, 1921. As a side note, in 1921 Carl A. Palmgren, plant superintendent of the Enderes Manufacturing Co., left to run newly-formed Damascus Steel Products Co. in Rockford, IL. Ernst Enderes holds a place of prominence as one of the representative business men of his native county, as he is president of the Enderes Manufacturing Company, which is engaged in the manufacturing of various types of tools at Littleport. The company has a well equipped plant and certain of the high-grade tools manufactured were invented and patented by the president of the corporation, who has long been known as a man of fine mechanical ability. Mr. Enderes was born on the old homestead farm of his father, near Communia, this county, and the date of his nativity was March 9, 1861. He is a son of John and Barbara (Prupst) Enderes, both natives of Germany and both honored pioneer citizens of Clayton county at the time of their death. John Enderes was one of the earliest settlers in the community about Communia, this county, where he established his home about the year 1849 and where he reclaimed and improved a good farm. He was a nailsmith by trade and prior to coming to Clayton county he had followed the work of his trade. Of the three children the eldest is William, who is a resident of Littleport; and Ernst and Emiline were twins, the latter being now deceased. Ernst Enderes was reared under the invigorating discipline of the farm and made good use of the advantages afforded in the public schools of the locality and period. In his youth he learned the trade of blacksmith, and at the age of twenty years he left the parental home and engaged in the work of his trade in Postville, Allamakee county. There he remained about four years, and he then, in 1885, established his home at Littleport, where for the ensuing twenty-six years he vigorously and successfully applied himself to the work of his trade, as the owner of a blacksmith shop. In 1907 he became the founder of the prosperous manufacturing enterprise of which he is now the executive head, and his associates as stockholders and directors of the company are Ernst and John W. Enderes, Christ C. Pust, Elmer L. Gifford, and George C. Ruegnitz, Jr. In politics Mr. Enderes gives his allegiance to no definite party but supports the men and measures meeting the approval of his judgment. He is affiliated with the local organizations of the Modern Woodmen of America and with the Brotherhood of American Yeomen. 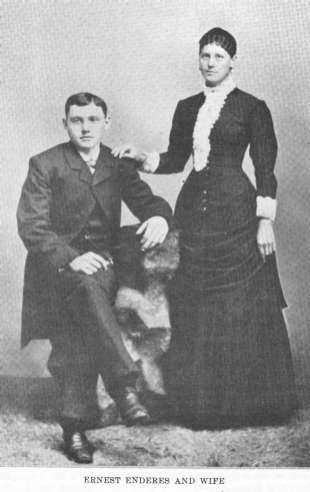 On the 18th of September, 1883, Mr. Enderes wedded Miss Louisa Hupp, who was born in Allamakee county, this state, and they have three children: John is associated with the manufacturing company of which his father is president; Rose is the wife of George Ruegnitz, of Volga township; and Elise is the wife of Seymour Lalleyer, of Littleport. Sales soon outstripped production capabilities, and an expansion was required. The entire operation was relocated to a new plant in Albert Lea, Minnesota. The old octagon tool plant burned to the ground in 1966, and we built our present plant. Enderes has always been a family-held corporation. American Swiss File & Tool Co.
Arion File & Steel Co.
Cleveland File Works,Cleveland File Co.
Johnson & Brother File Co.
Rex File & Saw Co.
Simonds 1955 Red Tang Files Catalog "I"
My sites cover specialized topics that are not covered elsewhere on the internet. I also try to spread knowledge by scanning and posting tool catalogs.